Russell Bobbitt kept his title hopes alive – barely – by taking the win at round nine of the AMA/Rekluse National Enduro Series in Noble, Maine. 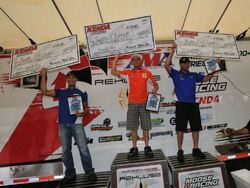 Charlie Mullins came into the event riding a five-round win streak and owning a 29-point lead in the series standings. The Obermeyer Am Pro/FMF Yamaha rider needed only to finish ahead of Bobbitt and Bobbitt’s FMF/KTM teammate Cory Buttrick to have a chance at wrapping the title up early, however, Mullins had an off day, while Bobbitt returned to his 2009 form, winning the final two tests to claim his first win of the year. Mullins ended the day in fifth, while eight-time national champ Michael Lafferty finished second ahead of fellow Husaberg rider Nick Fahringer and FMF/KTM’s Nate Kanney. Bobbitt’s only major setback was an ugly cartwheel in the fourth section. Luckily, the defending champ landed in a soft section of dirt and was able to get back into the hunt after a few minor adjustments. “I just had to adjust my levers to get going again, but it could have really been nasty,” added Bobbitt. Despite the off day, Mullins still carries a 17 point lead into the series finale in Indiana and needs only to finish eight to wrap up the title. Lafferty won the first two tests of the 78-mile event and held the lead until crashes in the fourth and fifth tests dropped the New Jersey rider to second behind Bobbitt. With the finish, Lafferty moved into third overall in the series standings. Like Bobbitt, Fahringer got faster as the day went on and he actually came from behind to beat out Kanney in the final two tests to claim third, which made for his third podium of the year. Kanney, riding the new KTM 350 SX-F, held on for fourth ahead of Mullins and FMF/KTM’s Cory Buttrick. The final round of the series is set for Saturday, October 2, in Matthews, Indiana.